201 E Chapman Ave ., Fullerton, California 92832. For a map, click here. TIME: The Box Office opens at 1:15 p.m. and doors open at 1:30 p.m. unless otherwise noted. Typically the shows start at 2:30 PM. ADMISSION: Adult price is $15.00 unless otherwise noted; children under 12 years of age are admitted free of charge. OCTOS members price is $12.00. Prices are subject to change. Make checks payable to FJUHSD Educational Foundation; Mailing Address: 1051 West Bastanchury, Fullerton, CA 92833-2247. Tickets are also available at the door. PARKING: Available in the parking structure south across Chapman Avenue. 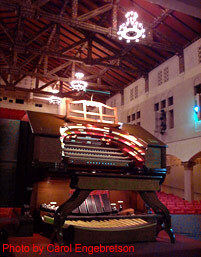 FOR BOX OFFICE INFORMATION: Telephone (949) 702-5110, Business Hours, Monday through Friday. FOR OPEN CONSOLE INFORMATION, comments, opinions and questions, contact OCTOS President David Marsh via email.